Dreams really come true in the UAE. Over the years, thousands have realised theirs and one more person who did so, on Saturday, is Michael Goulian. Ending a nine-year-long wait for a victory, the American pilot went on to clinch the Red Bull Air Race Championship in Abu Dhabi on Saturday. "It's been a long time coming. We had practiced week after week. We have been aiming for 53.5 seconds. We are all over the moon," the Abu Dhabi champion said, appreciating the efforts of Team Goulian. "We were looking at the World Championship but this win is the icing on the cake," he added confidently. In the Final Four, Goulian was the first on the track and set a winning time of 53.695 sec, which didn't look promising but at the end even defending World Champion Yoshihide Muroya failed to beat. The Japanese pilot of Team Falken smoked 53.985 seconds to remain without a win this time too in Abu Dhabi. Meanwhile, Abu Dhabi's defending champion Martin Sonka had to be satisfied with third with 54.650 second finish. "I am not happy with my performance and airplane. 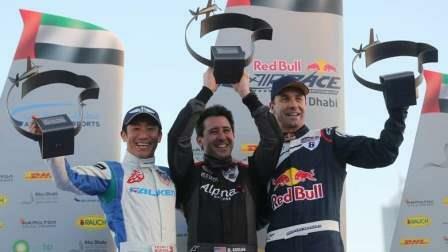 We could have gone out earlier than this, so I am happy with third place," Red Bull Team Sonka pilot said. The grand final marked the successful completion of 11th edition in Abu Dhabi. Al Fursan jets, Jet Pack Man, Pal Takats Paramotor Aerobatics and helicopters celebrated the finale with awesome displays. Such great manouevres from pilots going full throttle and side acts were thoroughly enjoyed by thousands of spectators. Local resident Abdulla Mousa was happy for Goulian but was looking forward to Sonka. "My children too like Sonka. He won last time and did well this time," Mousa said. There was also an incident as Chilean pilot Cristian Bolton smashed a pylon during Round of 14. The maintenance team, though, fixed it in minutes. "I thought the race wouldn't continue or there will be a big delay, but they were back in maybe 1 or 2 minutes," another resident Khalid Saleh said. Over the years, the annual showstopper event has seen new fans, brought back old ones and Abu Dhabi continues the magic.